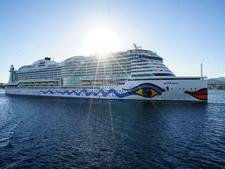 AIDA Cruises is Germany's largest cruise line, with a 12-ship fleet. AIDA's emphasis is on an active, ultra-casual cruise experience, which is reflected in every facet of the cruise experience: Dining is mostly open-seating in large self-service restaurants; passengers don't get dressed up even at night; crew members mingle freely with passengers when off-duty and there is a strong emphasis on wellness and fitness activities. The vast majority of passengers are German or from German-speaking countries, and all announcements, signage and tours are in German. The line can trace its history to 1960's East Germany. In 1960, Deutsche Seereederei, East Germany's state-owned shipping company, purchased the Swedish-American liner Stockholm of Andrea Doria sinking fame, renamed it Volkerfreundschaft ("Friendship Between Peoples"), and put it into service as a cruise ship -- or "holidaymaker ship," as it was called -- for the East German market. Later, the ship was chartered by foreign tour operators for part of the year. In 1985 the Volkerfreundschaft was retired and was replaced by the Arkona, which had been built only four years earlier as the Astor for an unsuccessful new West German cruise line. Like its predecessor, the Astor sailed part of the year as a "holidaymaker ship" for "well-deserved socialists" in East Germany, and the rest of the year on charter to Western tour operators. In 1991, after Germany's reunification, Deutsche Seereederei was privatized, and the Arkona was chartered year-round to the West German tour operator Seetours. In 1994, the company placed an order for its first new ship, from Kvaerner Masa-Yards in Finland. Named Aida and entering service in 1996, the ship introduced a totally new concept called "club cruising." Based on Germany's popular Robinson Club resorts (similar to a German Club Med concept), Aida's "club ship" experience was radically different from traditional cruising. Except for a small a la carte alternative restaurant, all the dining was buffet-style, there were no dress codes, and a strong emphasis was put on wellness and fitness-related activities. Meanwhile, the company also continued operating the traditional Arkona on charter to Seetours, which it later acquired from the huge German tour operator TUI in 1997. That same year, Aida was sold to NCL, but continued on charter to Deutsche Seereederei. In 1999, DSR's cruise operation -- now renamed Seetours, and incorporating both Arkona and Aida, which was bought back from NCL -- was sold to P&O Princess Cruises, the world's third-largest cruise operator. Recognizing the huge success of the "club ship" product, P&O Princess immediately ordered two new ships for the Aida brand from Aker MTW Werft, not far from Seetours' headquarters in the former East Germany. 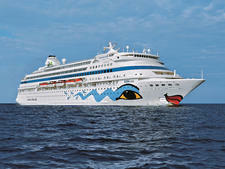 In 2001, Aida was renamed AIDAcara in preparation for the brand's second ship, which entered service in 2002 as AIDAvita. At the same time, Arkona was sold and replaced by a new brand, A'ROSA, a more upscale product loosely based on the AIDA concept. The A'ROSA fleet was made up of A'ROSA BLU, the former Crown Princess, and the newly built river cruise ships A'ROSA BELLA and A'ROSA DONNA. By now, Seetours was the largest cruise operator in Germany. The AIDA concept was so successful that P&O Princess created Ocean Village for the U.K. market -- essentially a British version of AIDA, though billed as "the cruise for people who don't do cruises" rather than "club ship." Despite the different name, Ocean Village, whose eponymous first vessel was previously P&O's Arcadia, copied almost all the aspects of AIDA's groundbreaking product. AIDAaura, the brand's third ship and an identical sister to AIDAvita, entered service in 2003. Shortly before the new ship's delivery, P&O Princess merged with Carnival, and AIDA became part of the world's largest cruise operator. 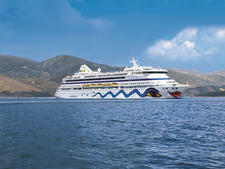 Shortly after the merger, Carnival sold the A'ROSA name and the two river cruise ships back to Seetours' former parent company, Deutsche Seereederei, while A'ROSA BLU moved to AIDA as AIDAblu, the largest-yet AIDA ship. Seetours -- still headquartered in Rostock -- was renamed AIDA Cruises and was now Carnival's sole German-market brand. Not long after the sale of A'ROSA, in 2004, Carnival announced an order for two new AIDA ships of a totally new design, to be built at Meyer Werft, the largest builder of cruise ships in Germany. 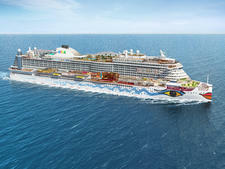 Before the first of these ships was even delivered, two more were ordered -- one in 2005 and one in 2006 -- demonstrating the popularity of the brand and the amount of confidence Carnival has in it. AIDA had one of its biggest years in 2007. The first of the new class of ships, AIDAdiva, entered service, while AIDAblu -- always purely a "stopgap" ship for AIDA, as it wasn't purpose-built for the company -- left the fleet, headed for that British AIDA copy Ocean Village. AIDAdiva's sister ship, AIDAbella, followed in 2008. The line then launched a ship a year from 2009-2014: AIDAluna, AIDAblu, AIDAsol, AIDAmar, AIDAstella and AIDAprima -- cementing its position as the largest German cruise line. There was a three year gap, followed by the launch of AIDAperla in 2017 and the following year, AIDAnova. AIDAmira, formerly Costa neoRiviera, will launch in December 2019, bringing the fleet to 14. AIDA's emphasis is on an active, ultra-casual cruise experience. The informal "club" ethos is reflected in every facet of the experience -- for starters, unlike almost all other cruise ships, off-duty crew are allowed to mingle freely with passengers. By day there is a big emphasis on wellness and fitness activities in the large and popular AIDA Spa and Fit & Fun, and on the expansive open decks. At night there's lively entertainment in the theater, and the well-patronized bars and lounges create a festive, easygoing atmosphere. Passengers don't tend to get dressed-up, even for dinner. Dining, as befits the unstructured "club ship" concept, is mostly open-seating and takes place in large self-service restaurants. While there is no main dining room, buffets on AIDA are executed with unusual finesse for mass-market ships. Wine, beer and soft drinks are included at lunch and dinner. For those who get tired of buffet meals, a la carte and specialty restaurants are available, depending on the ship. German is the onboard language, so passengers consist almost entirely of Germans and other German-speaking Europeans like Austrians and Swiss. AIDA passengers, as the onboard experience suggests, tend to be young, active and out to have fun; older Germans gravitate to the many more traditional and sedate cruise lines operating in the German-speaking market. On the line's newer, activity-packed ships like AIDAprima and AIDAperla, families with young children are more common. Crewmembers speak German and English, and important announcements, during the muster drill and on embarkation and debarkation days, are conducted in both languages. All tours, entertainment and ship signs and menus are in German. 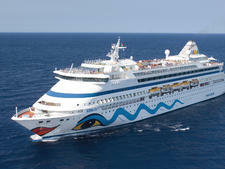 The original Aida, built in 1996, is now AIDAcara; the 38,531-ton, 1,180-passenger ship was refurbished in 2005. Similar but slightly larger are the 2002-built, 42,289-ton, 1,266-passenger AIDAvita and its 2003-built sister AIDAaura. These mid-sized ships form the backbone of the AIDA fleet. All were custom-designed for the "club ship" concept and thus feature two large buffet restaurants, along with only a small (extra-cost) waiter-service restaurant. There is the usual array of bars and lounges, a large theater, a big pool deck with volleyball/basketball court, a vast AIDA Spa, an equally big fitness complex called Fit & Fun that even includes an indoor putting green and golf simulator, and a kids club. Entering service in April 2007, AIDAdiva was much larger than previous ships in the fleet, coming in at 68,500 tons and carrying 2,050 passengers. A totally new design, this ship was the first in the fleet to have a large number of cabins with balconies, and offers more of everything -- more space, more dining choices, more amenities and more luxury. It was the first AIDA ship with multiple specialty restaurants. The highlight of the ship is the Theatrium, a circular, glass-walled, glass-domed combination theater/nightclub located right in the middle of the ship and surrounded by various bars and other entertainment venues. There's also a third main restaurant. AIDAdiva added new offerings like a steakhouse, pizzeria and sushi bar. Following AIDAdiva, the line rolled out AIDAbella (2008), AIDAluna (2009), AIDAblu (2010) and AIDAsol (2011). AIDAmar debuted in 2012, followed by AIDAstella (2013), AIDAprima (2014) and AIDAperla (2017). AIDAnova will debut late in 2018. Costa neoRiviera transferred to AIDA in May 2018; the ship will be refurbished and will debut in December 2019 as AIDAmira.